Nurofen interactive sales e-detail used to keep kids cool. A detail aid that gives parents the ability to understand how to use Nurofen's new device. 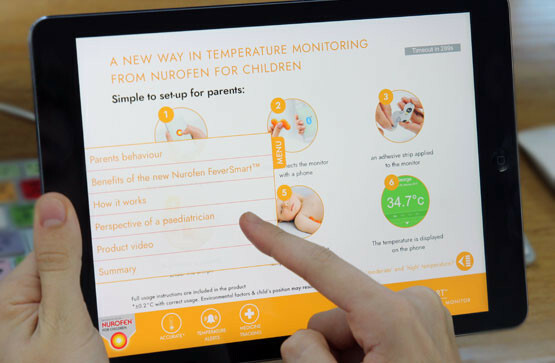 We developed an interactive sales e-detail aid for a new ‘Nurofen for Children’ temperature monitoring device for young children with fever. The temperature monitoring device is linked to a mobile app which gives parents real-time analytics and alerts them of any substantial change or higher than threshold temperatures. The e-detail aid allows sales reps to demonstrate the benefits of the product and includes CGI video content. It is integrated with RB’s CRM system for tracking usage and tailoring presentations for specific customers.